Contests on Facebook can be run in multiple ways! Companies can run contests on tabs with tools like the TabSite Photo Contest App. As well, Facebook recently loosened these rules to allow for more contest options and TabSite has responded to help Pages manage and run these additional options as well. So with TabSite, Page Admins can run Promotions on tabs (for greater design control, features, and lead capture) or deploy quick and simple contests in the News Feed. Let’s look at the News Feed Timeline Contest tool below. TabSite makes it easy with tools for management and deployment! 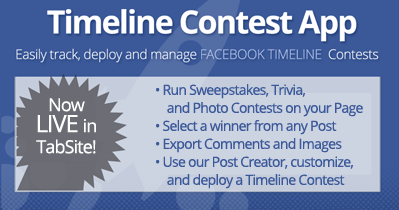 With the new Timeline Contest app, businesses can launch a quick & simple Facebook contest that is in the news feed using a normal post by the Page. TabSite’s Timeline Contest app does the work of sorting entries and picking winners for you. The tool allows pages to export the post data (likes/comments, etc) and randomly select winners according to the criteria you select. As well, at the Platinum plan level, TabSite users can run Photo Contests in the News Feed and easily get a export of all comments and photos on the photo contest post! Additionally, TabSite users can create, customize, and launch their contest post from ready-made samples in the TabSite manager, making it easy to deploy, manage, and select winners via a timeline contest! Once in the manager, select the Page (if more than one Page is managed in TabSite) from the drop down at the top of the page, then in the left menu click on the “Timeline Contest” button. To select a winner from posts already on your Facebook page, simply (1) click “Select a Post” which connects to your Page posts and pulls them in for viewing. Each post shows the post excerpt, created date, and number of Likes and Comments it received. Simply Click on the Post that you are using for the contest, Identify what criteria you were running your contest by, such as by Likes, Comments, Likes and Comments, and photos posted as a comment. The “Allow Duplicates” can be checked or unchecked. If duplicates are allowed, then in a “Like or Comment” contest where the user Likes (1 entry) and comments (a different entry), that user has 2 entries. Same for Commenting. If “Allow Duplicates” is on for a Comment contest, then one user can comment 26 times and have 26 entries. If the box is unchecked, that user with 26 comments gets 1 entry. Enabling selection of Multiple Winners, Downloading photos, and rejecting comments without photos are features available at the Platinum level. Then Download the csv file. For non-Platinum Plans, we store the most recent download only. For Platinum plans we store up to the most recent 5. At any time, simply delete the existing download to make room for a new download. Need help creating a post? We’ve got you covered. Simply select the type of post contest you want to run. Click the “Show More” button to see options. Then customize text and use our supplied image or click/drag to upload your own image and publish!. That’s it! We supply sample disclaimer text for you. For full setup instructions and details click to view our Help Guide. Again, available at FREE plans on up in TabSite! Read Facebook’s full promotion guidelines. What do you think? Are you ready to run a news feed contest giveaway? 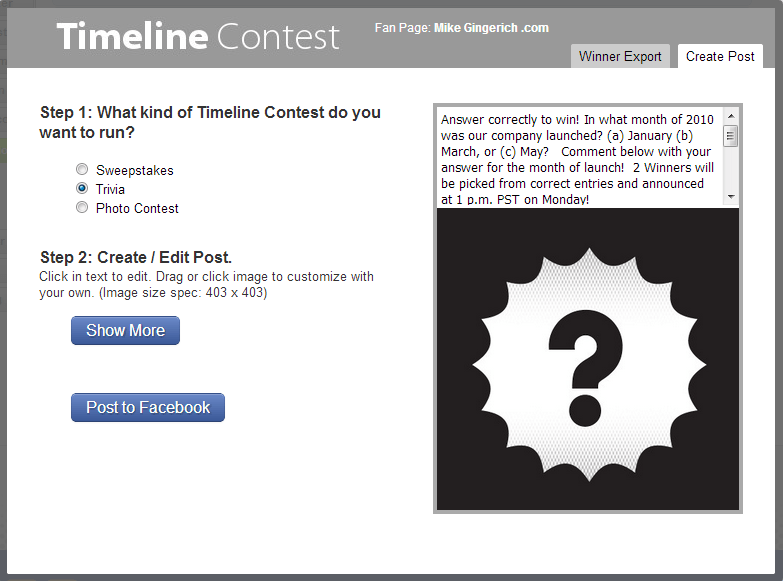 Want to learn more about running successful Facebook Timeline Contests? Get our eBook!